Two dead, dozens trapped in India building collapse: officials - SABC News - Breaking news, special reports, world, business, sport coverage of all South African current events. Africa's news leader. Rescue teams and ambulances were scrambling to Dharwad district where the five-floor under-construction building crumbled. At least two people have died and dozens are feared trapped under rubble after a building site collapsed Tuesday in India’s southern Karnataka state, officials told AFP. 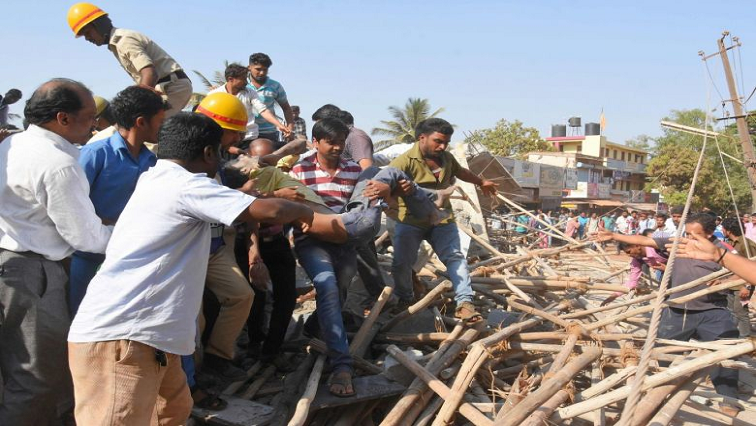 Rescue teams and ambulances were scrambling to Dharwad district, roughly 700km northwest of the state capital Bangalore, where the five-floor under-construction building crumbled. A thick blanket of dust and debris engulfed the area after the five-storey building collapsed. Desperate family members rushed to the spot searching for loved ones trapped in the rubble. Nagesh D.L., the district’s deputy commissioner of police, said 27 people had been recovered from the rubble and taken to hospital and rescue operations were expected to continue throughout the night. “We think there are still many people alive (underneath). The police still don’t have a clear idea…some locals say it is around 15, and some others have said it is over 50,” he told AFP. While locals joined in to help with the rescue efforts, police said that the national disaster response force team has also been drafted in. Hospitals in the district have been placed on alert and 20 ambulances sent to the accident site, said Dharwad’s top medical officer Giridhar Kokinad. Building collapses are frequent in India, with a string of accidents reported in recent years. Critics say many private builders use inferior construction material to cut corners on costs or bribe officials to bypass regulations. Last September five people were killed after an apartment block collapsed in Delhi. Just months, earlier a six-storey building collapsed on the outskirts of the capital, killing nine. This entry was posted on 19 Mar 2019,08:01PM at 8:01 PM and is filed under World. You can follow any responses to this entry through the RSS 2.0 feed. Both comments and pings are currently closed.